U. faculty failed to go through a competitive bidding process before awarding $10 million gene-sequencing contract to lab owned by billionaire donor Patrick Soon-Shiong. (Tribune file photo) University of Utah students walk around campus in April. 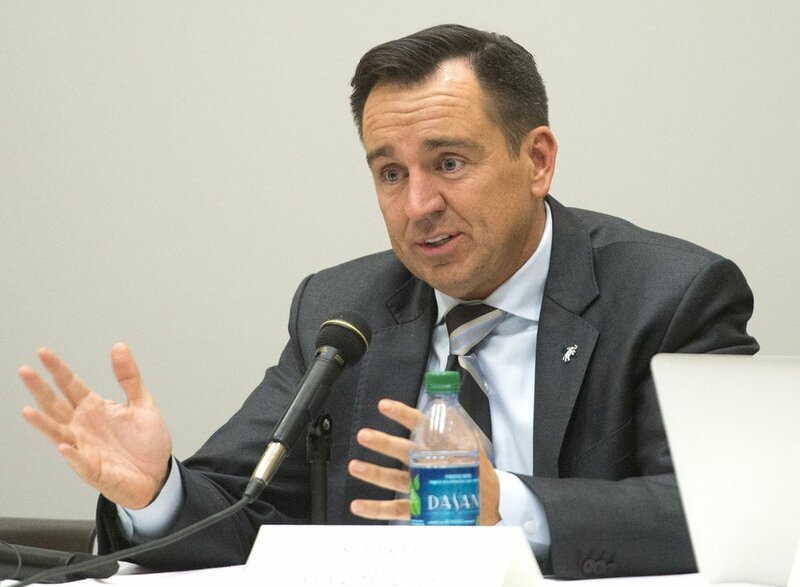 Utah House Speaker Greg Hughes chided University of Utah officials over a $12 million donation to the U. that auditors said was inappropriately used to purchase services from a company owned by the original donor. Pointing to a state audit released Tuesday, Hughes faulted U. faculty members for not following state procurement codes that required competitive bidding for purchases by public institutions, when the U. awarded $10 million to NantHealth for gene sequencing as part the university’s Heritage 1K project. NantHealth, based in Culver City, Calif., was founded by billionaire physician and philanthropist Patrick Soon-Shiong, who made the $12 million donation to the Salt Lake City university that funded the NantHealth contract. U. faculty members, the audit by the Office of the Legislative Auditor General said, also failed to negotiate the pricing of NantHealth’s gene sequencing services, resulting in a cost of $7,289 per genome sample — exceeding prices charged by comparable sequencing labs. Hughes, R-Draper, pressed U. representatives on whether the $12 million donation was originally intended as a partnership, or as an unrestricted gift. He questioned whether the U.’s requirements for a sequencing facility had been “Cinderella-slippered,” or written with specific and customized detail to ensure that NantHealth would receive a contract. Rick Egan | Tribune file photo) Greg Hughes, Speaker of the Utah House of Representatives. Two university representatives, Vice President for Research Andrew Weyrich and U. lead attorney Liz Winter, responded that the negotiations and structure of the $12 million donation pre-dated their roles on campus. In an interview, a U. spokeswoman said the university acknowledged its mistakes and had moved to re-educate employees based on the audit’s findings. The circular arrangement involving NantHealth was first reported by STAT — a news organization affiliated with The Boston Globe — prompting suspicion by tax experts and accusations that Soon-Shiong was using his donation to the U. as a form of money laundering. Tuesday’s audit noted that questions surrounding Soon-Shiong and the Heritage 1K project led to the audit, and that state law, when followed, protects institutions against suspicion of bias. NantHealth did not respond to The Salt Lake Tribune’s request for comment on the report. Hughes also asked if any internal alarms were triggered at the U. when local and national media outlets, including the Boston Globe, Politico and Fortune magazine, began scrutinizing the arrangement with Soon-Shiong and NantHealth. "Before the legislative audit, was there any concern form the university that there might be something wrong with this?” he asked. Winter said there was “tension” between U. administrators and Soon-Shiong, which may have contributed to ambiguities in the gift agreement. According to the audit, the $12 million donation was negotiated by former U. Health CEO and senior vice president of Health Sciences Vivian Lee, who resigned in April after the firing and reinstatement of Huntsman Cancer Institute director Mary Bekerle. Lee told auditors, according to the report, that Soon-Shiong set the price for sequencing services because “it was his business and he knew more about the cost” than U. faculty. U. Health spokeswoman Kathy Wilets said U. officials accept the audit report, and are already moving forward to implement its recommendations. Faculty will receive new training on the state’s procurement code, she said, and competitive bids will be considered for future service contracts. Wilets said the NantHealth contract was "a unique situation," and that university administrators do not believe that other grants, donations and contracts were mishandled. She also declined to speculate on Soon-Shiong’s motivations for encouraging the U. to select NantHealth for gene sequencing. U. representatives initially told auditors that the $12 million donation was conditional on NantHealth being selected as a service provider, the report states, which could have provided an exemption from a competitive bidding process. But correspondence later showed that Soon-Shiong requested that his company be the contractor six weeks after the donation agreement was signed, according to the audit, and after the first batch of genome samples had been submitted to the sequencing facility. “Because the request to use his company was not, therefore, a condition of the donation, it did not meet the exception requirements of state code,” the audit states. Auditors noted that the sequencing performed by NantHealth was of high academic quality, leading to scientific advancement and generating data for the Heritage 1K project that helped secure an additional $7.6 million in grant funding to the university. And Julie Kiefer, a U. Health spokeswoman, said the work performed by NantHealth assisted U. researchers in identifying disease-causing genes. While the U. fell short of state requirements in this instance, Wilets said, administrators are "thrilled" with the results of the Heritage 1K project.